Globalists clamoring to destabilize Thailand after July 3rd elections. Bangkok, Thailand June 29, 2011 - The Council on Foreign Relations (CFR), a think-tank representing the collective interests of the Fortune 500 corporations that constitute its corporate membership, and one of the many key architects of producing and implementing the global corporatocracy's agenda, has seized upon a conveniently timed Wikileaks dump regarding Thailand, just days before a controversial, highly contested Thai national election. Joshua Kurlantzick, a CFR "fellow for Southeast Asia," hails the Wikileaks-based hit piece penned by former-Reuters journalist Andrew Marshall as "perhaps the biggest bombshell of reportage on Thailand in decades." Unfazed by the tenuous, unsubstantiated nature of the alleged cables Marshall cited in his slanted "Thai Story," Kurlantzick concludes that this collection of hearsay, baseless commentary, and repeated rumors, relying entirely on the dubious credibility of both Wikileaks and the US diplomats who supposedly composed the cables, will "open discussion of the [Thai] monarchy even more, at a time when the election campaign, the growing crackdown on dissent, and the impending demise of the king all are terrifying Thais and forcing some reevaluation of their country’s political system, perhaps leading to a total meltdown of Thai politics." And that is the very point behind this conveniently timed hit piece penned by Marshall and released just prior to the elections. Just as in Tunisia and Egypt, where fortuitously released, and selectively reported cables were used as the rhetorical justification for what was in reality a foreign-funded plot, Marshall's rehash of years old rumors and cables that have been public for months gives the corporate-owned media a narrative to explain why US-funded rabble will soon be taking to the streets, implementing the "total meltdown of Thai politics" Kurlantzick predicts. This signifies the beginning of a third attempt to sweep away local institutions and nationalist leaders, and replace them with a stooge of the global elite's picking to implement economic liberalization (neo-imperialism) and fold the nation into the Wall Street-London centric "international order." Video: Freedom House, International Crisis Group, globalist-stooge Kenneth Adelman pined over Thailand's disinterest in humoring America's insistence on monopolizing ideas. Adelman accused Thailand of being an "outlaw among civilized members of the international community." More on Adelman can be found on 2Bangkok.com including how his feckless campaign coincided with Thaksin Shinawatra's employment of Adelman's lobbying firm, Edelman. The globalist stooge in Thailand's case is Thaksin Shinawatra, who ironically was reporting to the CFR in New York City on September 18, 2006 the eve of his ousting from power via a peaceful, orderly military coup. Since then, Thaksin has been represented by global elitists via their lobbying firms, including Kenneth Adelman of the Edelman PR firm (Freedom House, International Crisis Group, PNAC), James Baker of Baker Botts (CFR), Robert Blackwill of Barbour Griffith & Rogers (CFR), and Robert Amsterdam of Amsterdam & Peroff (Chatham House) - many of whom are either directly a member of the Council on Foreign Relations, or members of similar policy organizations working on behalf of the Fortune 500. Additionally, these men and the organizations they are affiliated with funded and organized the opposition groups and hordes of activists that flooded the streets during the contrived "Arab Spring," The New York Times reported in their April 2011 article, "U.S. Groups Helped Nurture Arab Uprisings" that, "a number of the groups and individuals directly involved in the revolts and reforms sweeping the region, including the April 6 Youth Movement in Egypt, the Bahrain Center for Human Rights and grass-roots activists like Entsar Qadhi, a youth leader in Yemen, received training and financing from groups like the International Republican Institute, the National Democratic Institute and Freedom House." The New York Times article continues by explaining, "The Republican and Democratic institutes are loosely affiliated with the Republican and Democratic Parties. They were created by Congress and are financed through the National Endowment for Democracy, which was set up in 1983 to channel grants for promoting democracy in developing nations. The National Endowment receives about $100 million annually from Congress. Freedom House also gets the bulk of its money from the American government, mainly from the State Department." Considering that these same nefarious organizations are now using their networks to fill the vacuums left in Tunisia and Egypt to rebuild both nations according to their own political and economic desires, it would seem troubling indeed to see the very same organizations backing Thailand's festering "red shirt" color revolution. The National Endowment for Democracy overtly funds Prachatai, the revolution's propaganda clearinghouse, to the tune of 1.5 million baht. Other foreign-funded globalist organizations, including Freedom House and International Women's Media Foundation (IWMF) have nominated and awarded Prachatai various contrived awards for its continuing role in foreign-funded sedition against the Thai government, in an effort to lend them a semblance of sorely lacking legitimacy. For more on Prachatai, see here. In turn Prachatai has been dutifully featuring Marshall's Wikileaks-based hit piece on a daily basis along with other anti-government and anti-monarchy rhetoric in an attempt to undermine both Thailand's current ruling government and the 800 year-old royal institution that has kept Thailand independent and free for centuries. Indeed, Thailand was the only nation in Southeast Asia to escape Western colonization. Even Thailand's neighbors to the north in China were divided and conquered by a combination of American and European interests. For centuries Thailand's royal institutions and the unity of the Thai people behind them have been cited by Thais and foreigners alike as the source of the Kingdom's long standing resilience. It then makes perfect sense why the very symbol of Thai unity, Thai history, Thai culture, and Thailand's undisputed independence is under attack by the modern day heirs of the British Empire, operating under the guise of an "international order." In Tunisia and Egypt where autocratic strongmen held their nations together, they were targeted, attacked, and toppled. The result is now warmongering traitor John McCain touring their capitals with Fortune 500 parasites at his side, including General Electric, Exxon, Coca-Cola, and Boeing, all CFR corporate members, surveying their newly conquered lands/markets and preparing to implement an insidious "Trade for Aid" bill. Surely that is not what the average Egyptian who took to the streets had in mind, but surely it was what their leader Mohamed ElBaradei had known quietly all along. ElBaradei, who began an effort to oust Hosni Mubarak a year before the contrived "Arab Spring" and whose activist networks had been training in the US as early as 2008, fashions himself as a vocal opponent even as he sits directly on the US International Crisis Group think-tank as a trustee, representing some of the very corporations now preparing to despoil Egypt and Tunisia. With Thailand's national elections looming, just as they did before Egypt's "revolution" began, all the pieces are coming into place. It is unlikely that a political movement led by a convicted criminal who openly conspires with foreigners to politically undermine his own nation, will be allowed to win elections via his overt proxy party, no matter how many votes he gets. The international corporate-owned media and corporate-funded think-tanks like the Council on Foreign Relations are beginning to prepare the official narrative, in the event that Thaksin's proxy party loses the elections, in an effort to foist upon the world a tale of an "oppressed people" rising up against a medieval system through grassroots activism, inspired by the "Arab Spring." 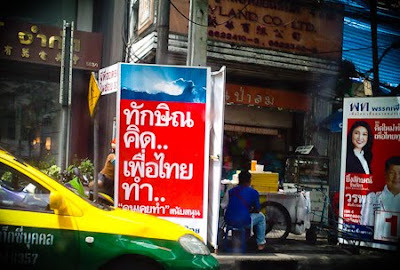 Photo: Thaksin Shinawatra's proxy "Peua Thai Party's" campaign sign reads, "Thaksin Kit, Peau Thai Tom" which translated means, "Thaksin thinks, Peau Thai does." While Thaksin's own political movement attempts to feign disassociation with him in front of informed audiences, in reality, his support is based on a carefully cultivated personality cult, where his name sells - absent of any real policy. To the sign's right, is a picture of Thaksin's sister, Yingluck Shinawatra who is literally running in his place as his "political clone." A CNBC article attempts to portray Yingluck Shinawatra as independent by boldly declaring in a recent headline that, "Yingluck is No Clone of Big Brother Thaksin." However, nowhere in the article is any evidence given to repute Thaksin's own claim. Indeed she is a proxy, led about on stage and along the campaign trail like a pack mule carrying along Thaksin and his foreign handlers' agenda. Of course, for those who bother to look behind this facade, they will see these "oppressed people" not as "grassroots" resistance spontaneously rising up, but as the centrally funded and organized political cannon fodder they really are. They have been indisputably led by Thaksin Shinawatra and his network of foreign supporters for years. This very moment, Thaksin's own sister, Yingluck Shinawatra is running in his place for the July 3rd elections. The "oppressed people," supporters of Thaksin Shinawatra and his proxy "Peua Thai Party," are organized into rallies by Thaksin's political lackeys and are often treated to phone-ins from Thaksin himself (as he is currently in self-imposed exile in Dubai evading a 2-year prison sentence.) The actual election slogan printed onto Thaksin's political party's campaign signs is, "Thaksin thinks, Peua Thai does." Was the situation on the ground in the Middle East as overtly alarming as it is here in Thailand now? Based on both the precursory actions of Egypt's Mubarak, Syria's Assad, or Libya's Qaddafi, along with the global corporatocracy's own actions throughout the Middle East it would seem like a possibility. Each subsequent uprising was caught by an ever more alert ruling government. As the pieces come into place, one can only hope that the Thai government has learned something from watching the foreign-funded "Arab Spring" unfold and understands the necessity and means of neutralizing it before unwitting, well-intentioned people are brought in as cannon fodder amidst violence that has surely been planned, to destabilize and topple the nation, thus preparing the way for John McCain and his Fortune 500 retinue to visit Bangkok next.